We may not have a Guillermo del Toro-helmed 'Dark Universe' film anytime soon (Doug Liman has signed on to direct), but the animated DC Universe is filling the void with the upcoming Justice League Dark R-rated home video. The first trailer has arrived with Batman joining forces with DC's supernatural superheroes. Batman (Jason O'Mara), Superman (Jerry O'Connell), and Wonder Woman (Rosario Dawson) and the rest of the Justice League uncover a global supernatural threat and turn to John Constantine (Matt Ryan, who played the live-action character on NBC's short-lived drama) for assistance. 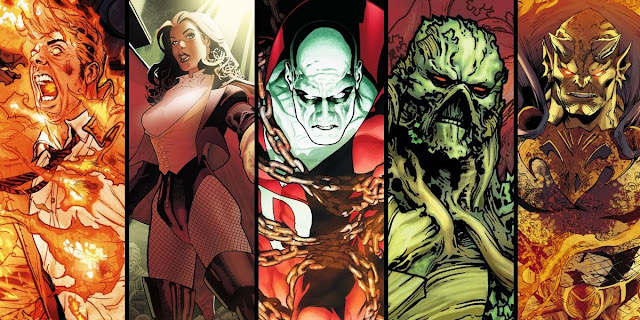 Swamp Thing, Zatanna, Dead Man, and Etrigan the Demon make up the magical, mystical wing of DC and are joined by familiar characters like Felix Faust and Destiny. Justice League Dark will be available on Blu-ray, DVD, and digital formats in the early half of 2017.